'Transformers 4' has been busy filming in Detroit, setting up car chases, explosions and the like. Aside from the numerous photos of the newly designed autobots and decepticons -- the various leaked set videos -- director Michael Bay and team Paramount have yet to reveal any official looks at the new cast ... until now! 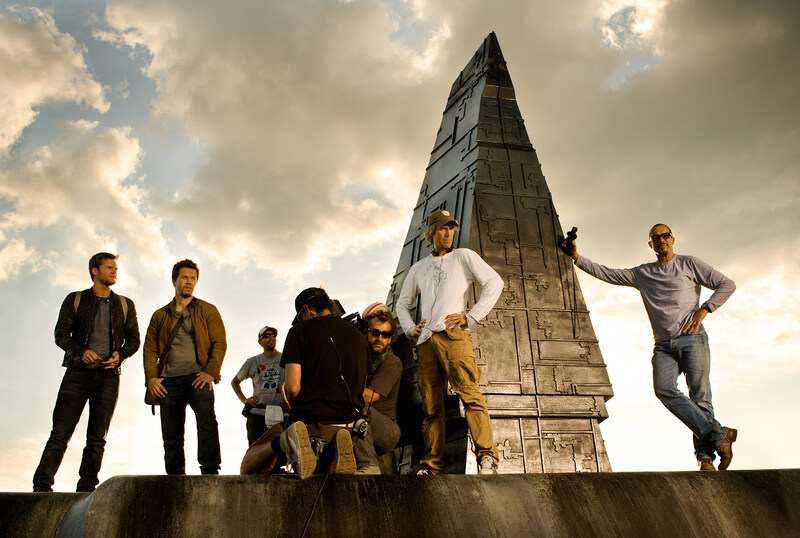 Officially released on Bay's website comes the first production still of 'Transformers 4,' featuring cast members Mark Wahlberg and Jack Reynor, and the crew setting up shop atop what looks to be a new piece of autobot technology. Little is known about the actual plot of the film, and Walhberg, for one, refuses to dish about its secrets. However, rumors have been circling that Dinobots will somehow play a part in the fourth installment. Until we get official confirmation, take that with a grain of salt. 'Transformers 4' also features Nicola Peltz, T.J. Miller, Shophia Myles, Li Bingbing and Kelsey Grammer, and will debut in theaters on June 27, 2014. See the photo in hi-res below.